The rise of the forces of jihadist Islam in Egypt places the US and other Western powers in an uncomfortable position. The US is the guarantor of Egypt's peace treaty with Israel. That treaty is based on the proposition of land for peace. Israel gave Egypt the Sinai in 1982 and in exchange it received a peace treaty with Egypt. Now that the Islamists are poised to take power, the treaty is effectively null and void. Then there are the supposedly iron-clad US and European security guarantees that accompany signed treaties. All the American and European promises to Israel—that they will stand by the Jewish state when it takes risks for peace—will be exposed as worthless lies. As we are already seeing today, no one will stand up for Israel's rights. No one will insist that the Egyptians honor their bargain. As it has become more apparent that the Muslim Brotherhood and Salafist parties will hold an absolute majority in Egypt's democratically elected parliament, Western governments and media outlets have insistently argued that these anti-Western, and anti-Jewish, movements have become moderate and pragmatic. Leading the charge to make the case has been the Obama administration. Its senior officials have eagerly embraced the Muslim Brotherhood. Indeed, the spiritual head of the Muslim Brotherhood Yusuf Qaradawi is reportedly mediating negotiations between the US and the Taliban. 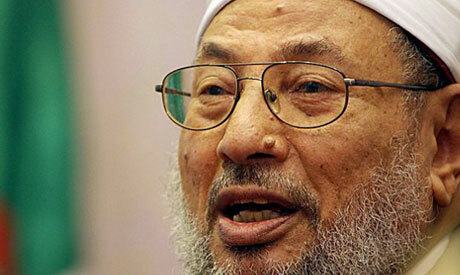 Qaradawi, an Egyptian who has been based in Qatar since 1961, when he was forced to flee Egypt due to his jihadist politics, made a triumphant return to his native land last February following the overthrow of president Hosni Mubarak. Speaking to a crowd of an estimated two million people in Cairo's Tahrir Square, Qaradawi led them in a chant calling for them to invade Jerusalem. Over the years, Qaradawi has issued numerous religious ruling permitting, indeed requiring, the massacre of Jews. In 2009, he called for the Muslim world to complete Hitler's goal of eradicating the Jewish people. As the Jerusalem Center for Public Affairs' Jonathan D. Halevi documented last week in a report on Muslim Brotherhood and Salafist positions on the future of the peace between Egypt and Israel, while speaking to Westerners in general terms about their willingness to respect the treaty, both groups place numerous conditions on their willingness to maintain it. These conditions make clear that there is no way that they will continue to respect the peace treaty. Indeed, they will use any excuse to justify its abrogation and blame it on Israel. And they will do so at the earliest available opportunity. It is possible, and perhaps likely, that the US will cut off military aid to Egypt in the wake of Cairo's abrogation of the peace treaty. But it is impossible to imagine that the Obama administration will abide by the US's commitment as the guarantor of the deal and demand that Egypt return Sinai to Israel. Indeed, it is only slightly more likely that a Republican administration would fulfill the US's commitment as guarantor of the peace and demand the return of Sinai to Israel after Egypt's democratically elected Islamist regime finds an excuse to abrogate the peace treaty. There are several reasons that these talks are doomed to failure. The most important reason they will fail is that even if they lead to an agreement, no agreement between Israel and the Palestinians is sustainable. Assuming for a moment that PA Chairman Mahmoud Abbas goes against everything he has said for the past three years and signs a peace deal with Israel in which he promises Israel peace in exchange for Jerusalem, Judea and Samaria, this agreement will have little impact on the Palestinians' view of Israel. Abbas today represents no one. His term of office ended three years ago. Hamas won the last Palestinian elections in 2006. "We say today explicitly so it cannot be explained otherwise, that the armed resistance and the armed struggle are the path and the strategic choice for liberating the Palestinian land, from the [Mediterranean] sea to the [Jordan] river, and for the expulsion of the invaders and usurpers [Israel]... We won't relinquish one inch of the land of Palestine." "The Islamic resistance movement of Hamas by definition is a jihadist movement by the Muslim Brotherhood, Palestinian on the surface, Islamic at its core, and its goal is liberation." With Hamas's Brotherhood colleagues taking power from Cairo to Casablanca, it is hard to imagine a scenario in which supposedly peace-seeking Fatah will win Palestinian elections. It is in recognition of this fact that Abbas has signed a series of unity agreements with Hamas since May. So the best case scenario for a peace deal with the Palestinians is that Abbas will sign a deal that Israel will implement by withdrawing from Jerusalem, Judea and Samaria and expelling up to a half a million Israeli citizens from their homes. Hamas will then take power and abrogate the treaty, just as its brethren in Cairo are planning to do with their country's peace treaty. Despite the fact that Israel is wholly absent from Gaza, and indeed is being attacked from Gaza, no one has called for the Palestinians to give the territory back to Israel. The UN doesn't even recognize that Israel left. Last September, the UN published yet another report labeling Israel as the occupier of Gaza. And in accordance with this fiction, the UN—along with the EU and the US—continues to hold Israel responsible for Gaza's welfare. Ironically, Hamas itself denies that Gaza is under Israeli occupation. In an interview with the Ma'an news agency on Tuesday, Hamas leader Mahmoud Zahar openly admitted that Gaza is not under occupation. Speaking of Fatah's plan to launch massive demonstrations against Israel, Zahar said, "Against whom could we demonstrate in the Gaza Strip? When Gaza was occupied, that model was applicable." Since the inauguration of the land-for-peace process between Israel and the PLO 19 years ago, the Palestinians have repeatedly demonstrated their bad faith. Israeli land giveaways have consistently been met with increased Palestinian terrorism. Since 1996, US- and European-trained Palestinian security forces have repeatedly used their guns to kill Israelis. Since 1994, the PA has made it standard practice to enlist terrorists in its US- and European-funded and trained security forces. The US and Europe have continued to train and arm them despite their bad faith. Despite their continued commitment to Israel's destruction and involvement in terrorism, the US and the EU have continued to demand that Israel fork over more territory. At no point have either the US or the EU seriously considered ending their support for the Palestinians or the demonstrably fictitious land-for-peace formula. To understand its feckless emptiness, all they need to do is direct their attention to what happened this week in Cairo, as the Muslim Brotherhood and the Salafists secured their absolute control over Egypt's parliament. Specifically, our leaders should note the absence of any voices demanding that Egypt respect the peace treaty with Israel or return Sinai.